How to adjust the maximum reverse speed on earlier 4QD control boards. This information applies to earlier 4QD series only. With issue 17 control boards the method of incorporating half speed reverse changed. It is now done by increasing the gain in the armature voltage sensing circuit so the feedback voltage is doubled in reverse, halving the output speed. The reverse speed on the 4QD series is a fixed proportion (approximately half speed) of the forward speed. However, the exact proportion is a little variable because of the ‘dead band build into the controller. See 4QD series controllers – Input Dead band removal for more information. 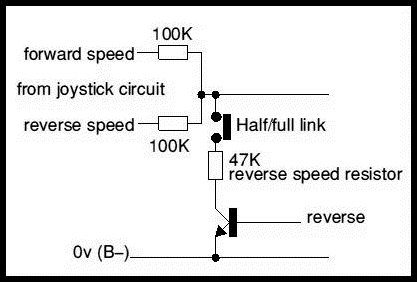 The actual ratio of forward to reverse speeds is controlled by a 47K resistor. For symmetrical speed (reverse speed = forward speed) the ‘S’ link is removed to open-circuit the reverse speed reduction resistor. This is shown in the circuit. So to alter the reverse speed, you can either change the value of the 47K resistor (higher resistors will increase reverse speed) or solder a second resistor across the pins of the ‘S’ link. 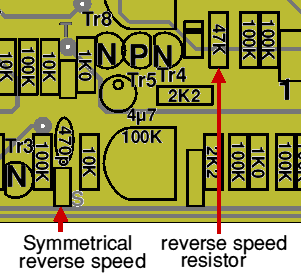 The position if the 47K reverse speed reduction resistor is shown on the diagram.